Having a troubling tenant is one thing but having to deal with a tenant who is being evicted is completely different scenario. Every landlord fears this particular scenario given the varied array of issues that come with it such as getting rid of such tenants, cash flow issues once the property is vacated and the time consuming process of finding new renters. 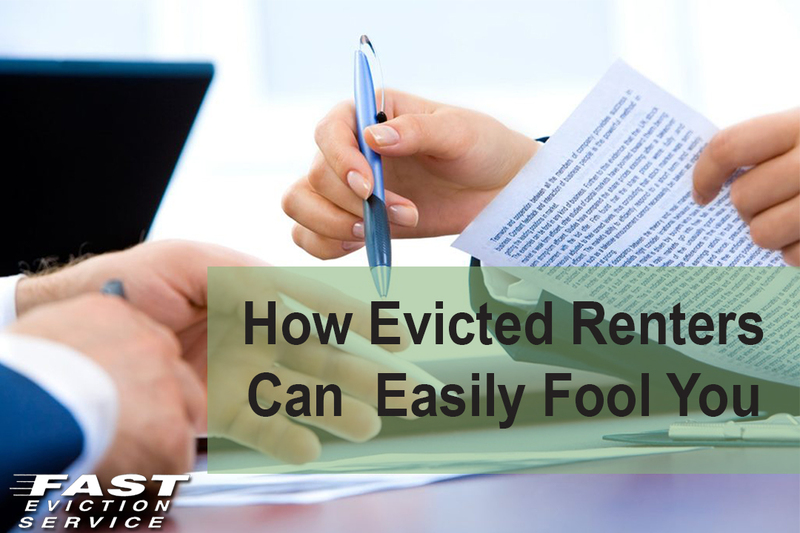 Therefore, landlords try to avoid recruiting tenants who might end up with an eviction notice. Let me explain it to you with an example. Once I received a call from mother of a family of 4 that included a stay-at-home mother, workaholic father, grandmother and a new-born baby girl. The family looked perfect to me as they fulfilled my criteria for recruiting renters, which was that renters need to provide 3xnet monthly income, clean rental history, job verification proof and good references from current landlord. Believing that I had hit the jackpot I scheduled a visit with this family. They loved the house and decided to move to the next level and discuss the legalities and terms of lease so that they could move in immediately. That’s where things became a bit interesting. They had provided their current residence address and current landlord’s contact number in their application. To perform a routine check I investigated a bit and got to learn that the renters were actually being evicted from their current rental unit. My concerns were brushed off by the family as they stated that it was just a glitch. Giving them benefit of doubt I contacted their current landlord only to find out later that one of their family members was posing as the landlord. When I called the landlord, whom I didn’t know at that time was a member of the renters’ family, I got to know that they were really good renters and if given a chance the landlord would want to rent them the property again. I wasn’t fully convinced though and decided to check public tax records, which informed me about the real name of the landlord and the actual address of the property. I reached the property and met the real landlord who told me that the tenants were indeed being evicted and they wanted to get my property rented ASAP because of the fear of being homeless. After hearing this, I declined them. I couldn’t think of myself dealing with such a mentally distressing situation and therefore, I decided to give myself a reality check and rejected that family. Tenants can lie and paint a picture of them being the ideal tenants but never believe their statements or take everything at face value but do your research and investigate their claims before finalizing the tenants.